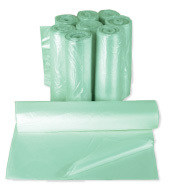 PCO2 Bags™ are made out of a BPI certified compostable resin.These bags do not contain any Polyethylene which is the common ingredient in standard HDPE or LDPE plastic bags as we know them today. PCO2 film is extruded from PPC raw material. This film is compounded with a proprietary material for film extrusion. PPC as a raw material has 100% biodegradable characteristics and consequently so does the PCO2 film. PCO2 does not take away feedstock from the food chain as is the case with other compostable corn or potato based resins. PCO2 can be extruded in thinner gauges than other known certified compostable film products, therefore, costing less to transport to market. Therein it has a much lower carbon and energy footprint. The film can be made and printed in many commonly found bag styles including t-shirt bags, shopping bags, take-out bags, can liners, die-cut bags and others. Meets ASTM-D6400: Compostable statute for sale in the state of California.